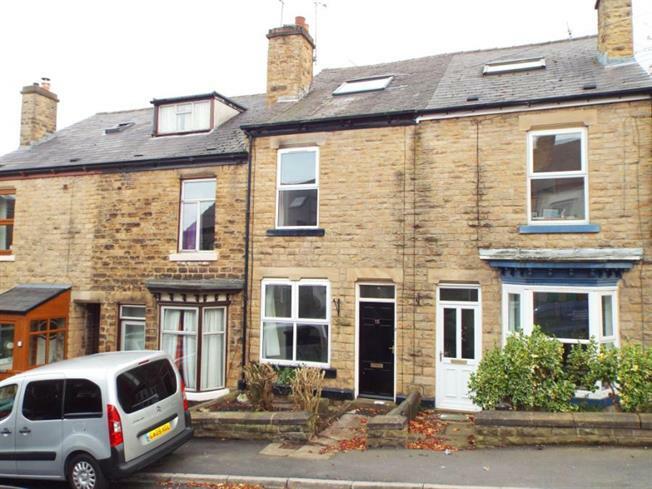 4 Bedroom Terraced House For Sale in Sheffield for £200,000. offering spacious accommodation over three levels with the benefit of double glazing, GCH, forecourt, extensive rear garden, views over Walkley to the rear, offshot kitchen. Ideally located just off the South Road for the full range of excellent amenities including local shops and supermarkets, schooling, public transport links with access to the city, principal hospitals and universities, local pubs, cafes, restaurants and independent retailers, local library and access to walks in the nearby Rivelin Valley. The accommodation comprises a carpeted lounge to the front. An inner hallway with cellar head access and stairs returning to first floor landing. The dining room has wood effect flooring, rear window overlooking the gardens and built cupboards with an open plan aspect into the offshot kitchen, fitted with an excellent range of base and wall units in a modern gloss finish with contrasting wood effect work surfacing, integrated, oven, hob and extractor, window to rear, Velux style window to the vaulted ceiling and rear access door. On the first floor, Bedroom one is carpeted with window to the front, bedroom two has window to the rear with aspect over the garden and views. The bathroom has been re-fitted in a modern contemporary style with WC, twin wash basins and bath with shower over and screen, tiled splash backs and flooring in a travertine effect and heated towel rail. A further staircase rises to the second floor landing. Bedroom Three is carpeted with Velux style window to rear offering natural light and far reaching views. Bedroom Four is carpeted with Velux style window to the front. To the exterior of the property is a forecourt to the front, and to the rear and extensive garden area providing excellent potential for an outdoor seating and entertaining area. An early viewing is highly recommended in this sought after location.